18 July 2017: DOD'S RUBBERNECK ANALOG DELAY TO HIT OUR SHORES SOON! 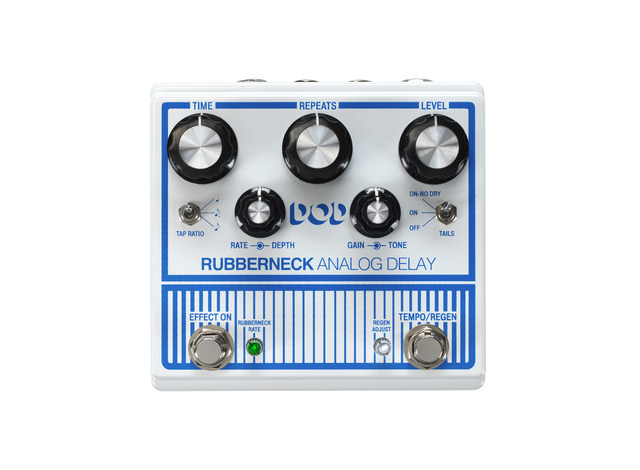 Home > Blog > 18 July 2017: DOD'S RUBBERNECK ANALOG DELAY TO HIT OUR SHORES SOON! The new DOD Rubberneck Analog Delay has double the features with the cool new double-wide chassis. The Rubberneck boasts over a second of warm and musical 100% analog repeats you crave, along with tap-tempo, subdivisions, and tails. Double concentric knobs give you independent control of the Modulation Rate and Depth as well as Gain and Tone of the delay. The impending shipment is not huge and pre-orders have already started, to hear one talk to your nearest Digitech dealer today.